The bonus squad is VIP, consisting of Alpha Trion and…er, well that’s it. Alpha Trion, Optimus Prime and Elita-One are in the exchange with accessories. As @elpapam would say: Good luck people and have fun. Seems like it’s always 1 bot when a new character is introduced, to keep scores low. This time no bonus squad, so scores stay even lower. Just do the gem offer and maybe play for accessories. Has those nasty flying pigs that you see in the spark run which take out easily your bot. @deindiaan The most probable reason for having to pay such a high amount of gems is that you made some in app purchases in the past. Yes I know about the offers getting higher when you make in app purchases. I made a couple so this is my bad now. My new character bundles are always for 1000 gems. If I were getting the 5000 gem offers, there is no way I would ever get new characters and would quit playing. As it is, these bundles are literally the only thing I spend any gems on anymore (except when they add something permanent like a new spark run slot). For those having the 5,000 gem bundle there will be (or at least previously have been) a 2,000 gem bundle from Tuesday or Wednesday onwards. This lower gem bundle has only 35,000 sparks and at most one accessory (in addition of a new TF). Any one know what materials are needed to upgrade Alpha Tron? @moifirst Thanks, just waiting for lower offer or luck in gold crates. There’s a guy in my group today with +210% bonus who’s making a hard push to hit 200,000 points. By my calculations, it’ll take him over 80 runs to do it. That’s insane to go that high with 210% promo. Was happy to hit a first place yesterday with 72k points, also running with 210% promo. 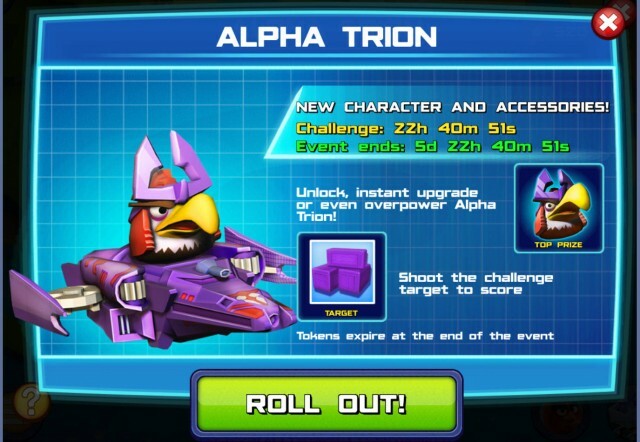 Need a few more tokens today and then I finally have 10k tokens for Alpha Trion :). I made sure that I took 1700 tokens a day. I used Hound with 210% promotion. I had two first places, two second/third places and one fifth. I used two recharges on four days and three recharges on one day as was 25 points short of 50,000.
i use alpha trion in spark events, but yesterday, when transformed in airplane, he don’t produce earthquake…. is normal???????? @davide No, that isn’t normal. When I use Alpha Trion in a spark run he still produces an earthquake when transforming into an airplane. I think at first I’ve made a wrong interpretation of your question. I was thinking, that your problem (no earthquake or maybe better called no shockwave) was specific for the sparks run. However, if you have the same problem in regular runs, then this is probably caused by the fact, that your bot (Alpha Trion (aka AT)) isn’t upgraded to a high level. Although I haven’t paid too much attention to this, I can remember that in the beginning I also couldn’t see any effects during transformations. But when the level of AT became higher, I started to notice its effects. So upgrading your bot to a higher level might be the solution. Then this will be highlighted in the text and the one ,who you’ve sent your message to will be notified.